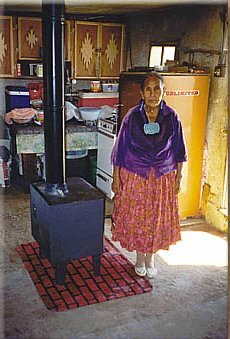 Our "STOVE ASSISTANCE PROGRAM" helps many Native American families who are in desperate need for the heat during our cold winters here in the southwest. According to the most recent study, 54% of Navajo homes burn wood for heating. But not necessarily in wood stoves. 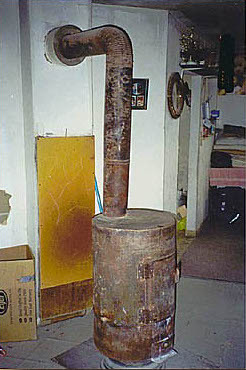 You see, some Native Americans cannot afford real wood stoves (see right), and instead fashion stoves out of sawed-off water barrels or other metal containers Needless to say, these makeshift stoves are notoriously dangerous. That's why we created our Stove Assistance Program, whereby we install new Wood Stoves for Families in need of warmth. Our costs to install a stove in a conventional house will range between $800.00 to $1000.00. For a Hogan, the cost will range between $600.00 - $800.00. We supply building materials (lumber, sheet rock, roofing paper, roofing cement, etc.) to repair any walls, ceilings and roofs supporting the stovepipes and chimney sections. NOTE: OUR OWN 2-man crew handles all our stoves installations. Often we receive referrals from medical professionals asking us to help families with a propane heater in lieu of a coal/wood-burning stove because of a severe medical problem in the household. Oxygen machines might be in use therefore open flames are not appropriate. It is very expensive oftentimes exceeding $1,000.00. Oftentimes we absorb the entire cost. The surrounding trees and open-pit coalmines on the Navajo Indian Reservation provide the necessary fuels for our stoves. Families provide their own transportation. The elderly rely on members of the immediate family, other relatives, caretakers or Indian Community Health Representatives to deliver the wood or coal to them. Meet established poverty income guidelines. Existence of an unsafe heating stove in use. Has never before received a stove from the Southwest Indian Foundation. Our goal is to install between 200-250 stoves annually. This goal is attainable but only with the full cooperation of nominating needy families. 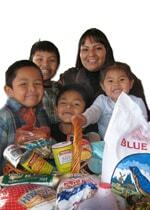 The Zuni Pueblo Indians are also participating in our stove assistance program. Hopefully you will remember these needy families and please remember any gift is appreciated. As we continue to expand this critical and ambitious project, we know that it will only succeed if we all work together. Just click on the button above if you would like to help. Thank you and God bless you and your family in all of your endeavors.